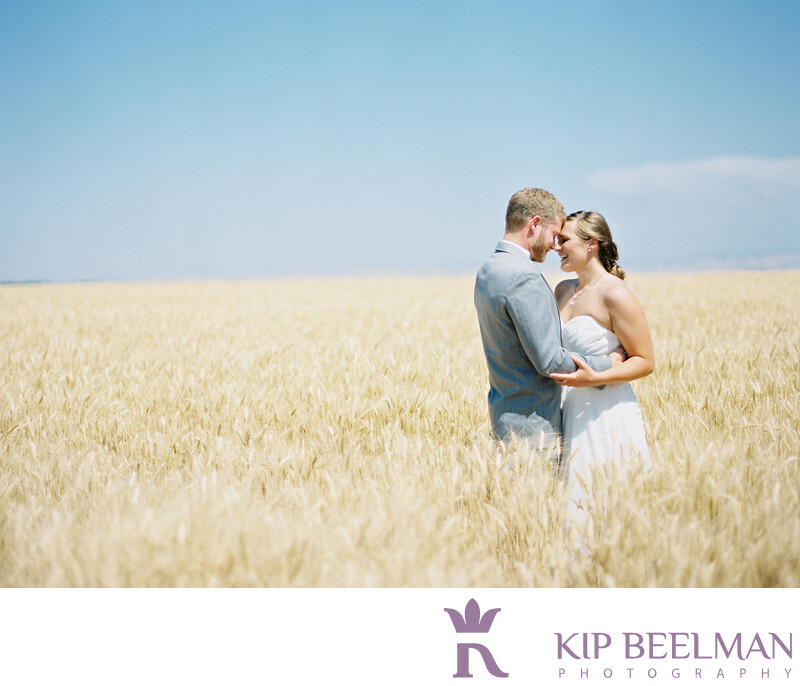 Home of the famous Pendleton Roundup, Pendleton, Oregon wedding photography provides a real chance to fall in love with the great outdoors and some great locations. Instead of horses and rodeos, this day was all about love, nature and fun. This touching photo was taken just moments after the couple’s wedding ceremony – the bride and groom wanted to sneak away for some portraits in the nearby hillsides surrounding their church before returning to the excited receiving line and the rest of the big day. Even in the midst of all that wedding busy-ness and emotion, the couple was able to take a deep breath, to soak up the beautiful world around them as well as the beauty right in front of them. I love the soft colors and soft smiles. After these blue sky photos and that receiving line, the couple hosted one of the coolest receptions I have ever been invited to photograph for a wedding: The Kiwanis Cabin deep in the Umatilla National Forest was one of the bride’s favorite childhood camping destinations and it created a cozy, warm and real location to celebrate their nuptials with close friends and family. The cabin included outdoor picnic tables just alongside a lazy river deep in a mountain valley with a nearby lake and the rich smell of Douglas fir, blazing fires, great food and great fun. Clearly, this couple appreciates the beauty of nature and the sweet things in life, so it was wonderful to celebrate (and photograph) so much of the day outdoors. Location: Umatilla National Forest, Kiwanis Cabin. Keywords: Church Wedding (21), Oregon (6), Pendleton (3).